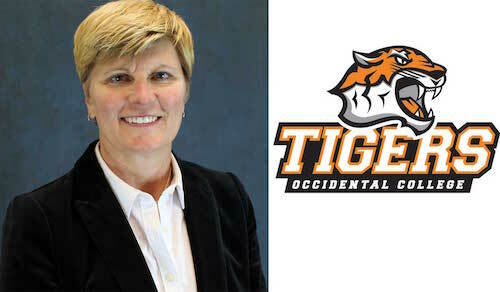 Shanda Ness has been named the new Occidental College Athletic Director, Vice President for Student Affairs and Dean of Students Rob Flot announced on Friday. Ness comes to Occidental with more than two decades of experience as an NCAA Division III athletic director, assistant athletic director, and coach. She is currently the athletic director at Thomas College in Waterville, Maine, where she is responsible for 16 varsity sports and one club team that compete in the North Atlantic Conference. "I am beyond excited to be joining the Occidental community and have the opportunity to lead and mentor coaches, staff and student-athletes," Ness said. "It was clear from the moment I stepped on campus that providing an exceptional student-athlete experience was a high priority and I look forward to continuing to enhance that experience." Prior to coming to Thomas, Ness spent 11 years at Cornell College of Mt. Vernon, Iowa, where she served as the interim athletic director, assistant athletic director, senior women’s administrator and head softball coach. As Cornell’s softball coach she was named Midwest Conference Coach of the Year. Ness also served as head softball coach and assistant volleyball coach at Gustavus Adolphus College in Minnesota, where she was twice named MIAC Coach of the Year, and at Dakota Wesleyan University in South Dakota. She is a graduate of South Dakota’s Northern State University where she also earned her master of arts in teaching. "After a review of all the feedback obtained during the on-campus interview, Shanda was the consensus choice of the final four candidates, each of whom came to campus for interviews as part of our national search," said Flot, who has been serving as Oxy's interim athletic director. "The committee was especially impressed by her understanding of the role of athletics in a liberal arts environment and her experience in building and strengthening athletics programs, as well as in recruitment and gender equity issues," Flot said. "Shanda is a student-centered, proven leader who communicates with honesty and compassion. The extensive feedback that was received from the students, coaches, faculty and staff who met with Shanda during her on-campus visit echoed this assessment, confirming that Shanda is the right choice for Oxy's new AD." Noted Ness, "I would like to thank the search committee and campus community for their support throughout this search process. I am looking forward to igniting Tiger Pride and developing a strong culture rooted in excellence." Shanda’s first day at Oxy will be March 11.